Dan Palmer of Operation GRACE. The overwhelming drug problem in Scioto County has touched almost every person in our community in one way or another. While there are multiple resources available to those who find themselves struggling with addiction, we often forget the people that find themselves completely dependent on these individuals. The children of Scioto County, who have parents or guardians that struggle with addiction, are often forgotten or left behind. Dan Palmer, district coordinator for the SWMD, noticed this issue and felt compelled to do something about it. After attending two heroin conferences last year, held by the Attorney General Mike DeWine, Palmer came back to Scioto County thinking he had to get involved. 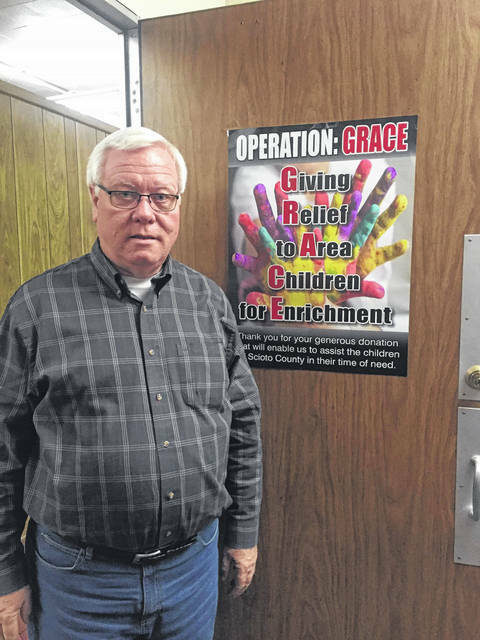 Since Palmer began his mission to collect donated items, through operation GRACE, to assist children in need, he has received a great deal of support from the county, and some very generous individuals from outside of Scioto County. Melissa Butterworth of MPH hotels, along with Regina Chaffin, the general manager of the Holiday Inn in Ironton, heard about Palmer’s mission after hearing him speak and came forward with several large donations. Butterworth was touched upon learning about the basic hygiene items that some children are forced to go without. “She was able to donate over 500 bars of soap, several boxes of hair conditioner, shampoo, and body wash and dozens of brand new towels. These towels will be distributed to schools in the county so children can have the opportunity to bathe before they leave school,” said Palmer. Operation grace has also recently received a large donation of shirts from SOMC, and is expecting a few other large donations in the upcoming weeks from other local businesses. Palmer has also received a huge amount of support and partnership from Judge Alan Lemons, and his passionate staff. Through the juvenile court system Palmer receives lists of children in need of assistance, as well as, requests from teachers who fill out request forms on behalf of their students. The Operation GRACE student assistance program request forms lists available health care items like tooth brushes, tooth paste, combs, hair brushes, soap, shampoo, deodorant, and feminine hygiene items, and other needs like socks, underwear, T-shirts, shoes, sweat shirts, and coats or jackets as well as a section to provide the required sizes for these clothing options. The forms also include a section for additional needed items, and requests. On Nov. 18, Palmer attended the Community in Action conference in Licking County where the discussion was focused around opioid addiction. Palmer was able to share with o,thers the devastation he has witnessed first hand from children of addicts and received many words of support from those who recognize the good that is being done through operation GRACE. Although the operation has received a great amount of community support already, they are still very in need of clothing items, especially items appropriate for the upcoming winter months. “Anyone that wants to donate to operation GRACE, we are in need of new clothing items for both boys and girls from grades kindergarten to high school. Tops, pants, shoes and jackets are our main collection priority right now, but we are grateful for any items donated,” Palmer said. Operation GRACE collects new items only, for the benefit of the child. “With everything these children are struggling with and having to deal with, providing them with something nice and new is what they deserve,” Palmer said. Operation GRACE is currently housing its donations in a small donated space, but Palmer says he would love to see the donations outgrow the current space, and be able to positively impact the lives of even more children in need. For anyone wishing to donate to Operation Grace, reach Palmer at his office to arrange for a pick-up, or drop items off at the Scioto County Court House, commissioner’s room 1, in the basement.